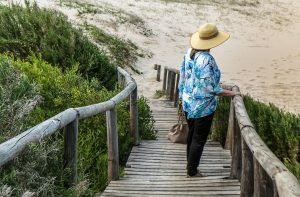 Divorce Over 50: Is it Ever "Too Late" To Start Again? Someone recently commented to me that, for women over 50, divorce is a “death sentence” and circumstances mean that there is no hope of a happier future. The words reminded me of the deep pain and despair that divorce can bring; when so much of your life was invested in your marriage, how does starting over feel possible? Although I was younger when my own marriage ended, I actually felt the same way as this lady. I was 36 with three young children and the thought of starting over terrified me. I felt too old, too burdened, too broken; looking ahead was daunting. I had lost all of my security and I had to forge a new future; could I ever be truly happy again? I honestly didn’t believe so. But age is not necessarily a determining factor in getting over the end of a relationship. I encounter people in their 20s who believe their best days are over, and those in their 60s who have healed and found love again. Length of relationship can sometimes feel very relevant. If you’re grieving a relationship of 25 years or more, it might appear more heart-breaking than a marriage of only 5 years. But every grieving process is personal. We all have our own stories, our own pain and each healing journey is different. It is normal to feel that life is doomed to despair after a break-up. After all, when you deal with an ending as significant as a bereavement, it’s important that you don’t dismiss or deny that pain. But, while our hearts still beat and we wake up each morning, there is still a meaningful life to be lived if we want it, whatever our age. Of course, a future at 50, 60 or 70 will look very different to that of a 30 year old. The regrets may feel bigger, the sense of time lost and slipping away will feel more tangible. 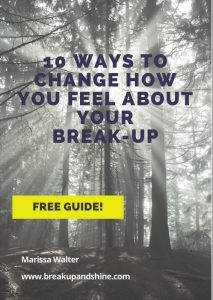 However, just as divorcing young doesn’t guarantee that starting over will be easy, being in the middle or later years of life need not resign you to permanent unhappiness. It’s never too late to start over unless you tell yourself that it is. Change can begin today, circumstances can shift in months (or even weeks) in some cases. It all starts with believing, even for just a second, that it’s possible. I don’t suggest that it’s easy; in some cases, circumstances are so tough that changing your mindset can be the hardest thing you’ve ever done. But when your heart is broken and everything else feels beyond your control, remember: your perspective on the future is one thing which is up to you. Want to learn more about how to make the shifts from heartbreak to a happier more fulfilling life? 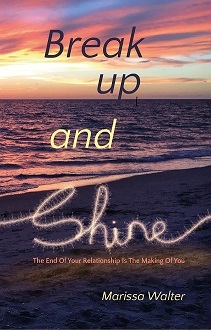 Break Up and Shine is now available from Amazon in paperback and e-book.